Orson Wheeler (1902-1990) was a sculptor and teacher at Concordia University who created scale models of over 200 architectural buildings from around the world in Roma Plastilina (plasticine). He bequeathed the collection to the School, and they are presently used for teaching. Approximately 40 of the smaller works are on display in a wood and glass case at the entrance to the Macdonald-Harrington building. Selected models are displayed on the 3rd floor of the building. 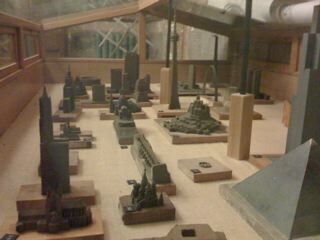 Models on display are accessible to all (Orson Wheeler Architectural Model Collection).